From the author and illustrator team that created the Gaston (a gorgeous story about four sibling puppies, Fi-Fi, Foo-Foo, Oh-La-La and Gaston) comes the sequel, Antoinette. Antoinette's brothers, Rocky, Ricky and Bruno, all have special skills. One is clever, one is fast and the other is strong! However Antoinette is a little bit worried that she hasn't yet figured out what her special skill is. Her Mother isn't worried though, she knows that Antoinette has something 'extra special'. She can feel it in her bones. One day, while playing in the park with her friends, Gaston, Fi-Fi, Foo-Foo and Oh-La-La (I seriously never get tired of saying that!) Mrs Bulldog realises that a puppy is missing! Oh-La-La is nowhere to be found. They all begin to search and despite her brothers using their special skills, Oh-La-La remains missing. It is then that Antoinette feels 'a tug in her heart and a twitch in her nose' and sets fearlessly on the chase to find her missing friend. This is a beautifully illustrated story of adventure and bravery, with a wonderful twist of humour threading throughout. The text is simple, yet thoroughly engaging as it addresses the reader and the characters in a colloquial manner. Littered with French phrases, it becomes a fun early language introduction to very young children and a joy to those of us parents who wish we could speak French but sadly can not! The characters are all completely lovable, and I defy even the least dog inclined reader to resist falling in love with this story and it's four legged heroes. 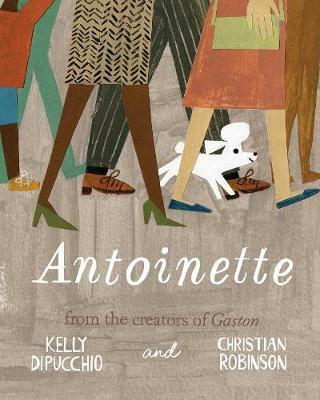 A sequel that lives up to the original, I hope to see more adventures from Antoinette, Gaston and their siblings in the future.